Zheng Wuchang was one of the leading art historians of the early 20th century. His paintings are conservative and typically detail in their inscriptions the paintings and art historical theories to which they relate. This particular inscription reads: ‘On ten thousand cliffs and a thousand peaks, ‘jades’ accumulate brightly; On the small bridge and the bend of harbour, [I] look for poems quietly. 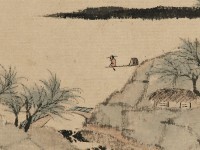 Describing snow without using white powder pigment, this is a technique from the Song period’. Zheng Wuchang was one of the leading art historians of the early twentieth century. His paintings are conservative and typically name in their inscriptions the paintings and art historical theories to which they relate.